Pain is one of the most common health issues in modern life. The modern lifestyle is hitting hard on all parts of our body. We sit more, move less, sit in the same chair for 8 hours every day. Pain interrupts your life and work. There are several ways to relieve pain. One of the most popular way is to use topical analgesics including pain relief creams, gels, spray, patches, and powder, etc. This post will give you the basic ideas of best topical pain reliever and the best pain relief cream reviews. When applying pain relief cream or gel to the body, we can target directly and exactly the spot with pain. You can control the size of the are you get the gels or creams on. Many other methods of pain treatment are limited on size. Some are too bid, some are too small. Topical pain relievers are much more flexible. Once you apply the reliever on your body, you will notice the difference right away. In case of oral medication, you will have to wait for it to enter your bloodstream, processed by organs, and take affects. During the waiting time, your pain is still there. And trust me, the time you count for a decreased signal is longer than the actual. There are not so many side effects to best pain relief gels, compared to the oral medication. It is much safer to use pain relieving cream rather than taking a dose of pills or tablets. Therefore, you can use them in a longer time with less worry. It is safe to say pain relief gel and cream are the easiest pain relivers to use. You do not need a large space to lie down like massage method. You do not need a sauna. 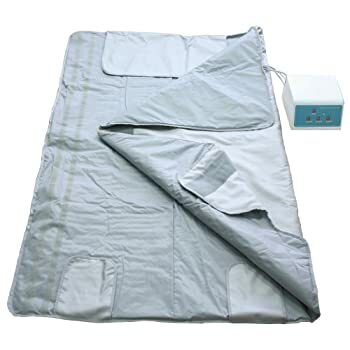 You do not need electricity like the heating pads. You do not even need water like when you take pills. All you need is a tube of the best pain relief gel and your hand. The effect of even the best pain relief cream widely depends on you to choose the most suitable one. There are several factors to consider when buying a topical pain reliever but below are some major ones. The active ingredients are where the pain-relieving effect comes from. There are several of them but we will take a closer look at the most common ones. Menthol is derived from peppermint and other mint oils. It is a waxy, crystalline substance, either white or white and will turn solid at room temperature. Menthol creates the cooling sensation by chemically activating the cold-sensitive receptors in the skin. Camphor comes from the wood of the camphor laurel tree, and the oil of turpentine. When absorbed into the skin, it acts similarly to menthol but more like a local anesthetic and antimicrobial substance. Capsaicin is derived from hot chili peppers. It creates a burning sensation and blocks the pain receptors of the skin. Best arthritis pain relief cream usually contains capsaicin. Counterirritants consists of ingredients like menthol, camphor, eucalyptus oil and salicylate. They can create either heating or cooling effects. Counterirritants create different, milder sensation to distract users from the pain. Although the effects of them do not last long, it is instant. They often present in best muscle pain relief cream and joint pain cream. Salicylates are one nonsteroidal anti-inflammatory drug. 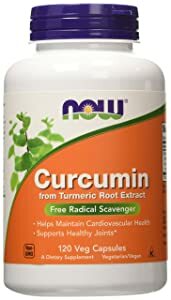 It is a perfect ingredient for best arthritis cream. You can also find it in aspirin. Salicylates reduce pain by blocking the transmission of nerve impulses. It is recommended for pain in joints that are close to the skin, fingers, elbows, and knees. However, if you are allergic to aspirin or under blood thinner description, it is better to consult your doctor before taking product with salicylates. Arnica is from the arnica plant which is famous for its pain-relieving effect for centuries. Arnica is effective on sore muscles, aching joints, and inflammation. The result requires a long wait sometimes. When you make up your mind on what active ingredients you want to have in your cream or gel, you should pay attention to the percentage of the strength of the ingredient. It decides how strong or concentrated the cream is. 6% – 12% products are for spot treatment, and consumers’ taking home application. Product with the percentage of 3% if for broader area applications, massage, or deep muscle treatment. Each cream and gel have its own preferred pain. Identify your pain and find the product that best treat your uncomforting area. In general, a pain relief cream will work for almost all of the common body pain but the efficacy will vary. The best way is to choose the one that is for your pain specifically. Look at the brand name and ask if they are reputable. Do they have any previous scandals with their product? Are they experienced in pain treatment industry? Do the consumers recommend them? There is a reason a brand can get to the top. Usually it is their product quality that get them there. After we get through all of these information, we would like to present our picks for top 9 best pain relief cream and best pain relief gel. Pain relief for shingles symptoms – you will be free from the pain that shingles virus cause. Organic and food grade ingredients – the product have organics and natural products. There are no chemicals, irritants, or fillers in the cream. It is paraben, sulfate, mineral oil, alcohol, fragrance, and gluten free. pH balance – the product pH level is balanced to match the skin’s native pH level. The effect of this is that the acid mantle or the protective layer of the skin can stay intact and healthy. It will enhance the skin ability to fight back bacteria, viruses, and other harmful substances. Satisfaction guarantee and money back guarantee – if you are not satisfied with the result that DermaChange Shingles Symptom Relief Cream offers, you can ask for your money back within 30 days, no question asked. 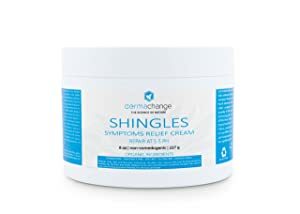 When talking of pain relief in general, DermaChange Shingles Symptom Relief Cream with its focus on reduce pain by shingles virus only is a minus point. If you want a cream that can treat various pain, this is not a good choice for you. Recommended use: 4-6 times per day for maximum benefit. What more to know about? DermaChange Shingles Symptoms Relief Cream is use for shingles treatment only. You should not use it to relieve other kind of pain. Amish Origins Deep Penetrating Pain Relief Cream (Greaseless) is a Menthol 8% pain relief cream works for arthritis pain, sore muscles and joints, etc. Work for multiple pain – arthritis, sore muscles and joints, cuts, abrasions, bruises, cough due to colds, head colds, throat congestion, sinus problems, etc. Coughs and sore throats: rub on soles of your feet for coughs apply liberally on throat or neck for sore throat. Children under 12: consult physician prior to using. The product also contains salicylates so if you are allergic to aspirin, consult your doctor before applying the cream on your body. Biofreeze Pain Reliver is the pain relief gel from Biofreeze, the company that has 25 years of experience in the pain-relieving industry. It is effective to pain, everyday pain, prior applying before exercise or therapy. Pain relief for various pain – With 4% of Menthol as the active ingredient and the proprietary herbal blend of Camphor, Aloe, Arnica, Burdock Root, Boswellia, Calendula, Green Tea, Ilex, Lemon Balm and Vitamin E gives the gel synergistic effects on the body. The gel can reduce arthritis pain, muscle pain, joint pain, back pain. Fast Acting and Long Lasting – the Biofreeze Pain Reliever takes effect instantly and can last for a long time. There are complaints for customers that the actual product contains only Menthol 3.5%, not Menthol 4% as the brand claims. Do check when receiving. If you have a sensitive skin, ask a doctor before using the gel. Do not apply the gel on irritated skin. Pure Body Naturals Hot Cream is the solution for cellulite. It can reduce the appearance of cellulite, relax muscle to decrease muscle pain. This can also be used as a massage or therapy substance. 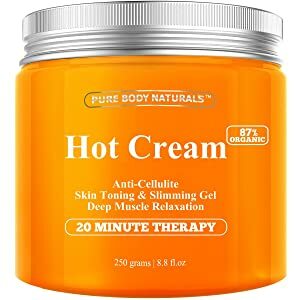 Pure Body Naturals Hot Cream focuses on removing cellulite. Although it does help with pain relief, I would suggest you looking for another product if you just want a best arthritis pain relief cream, best muscle pain relief cream, or best cream for back pain. 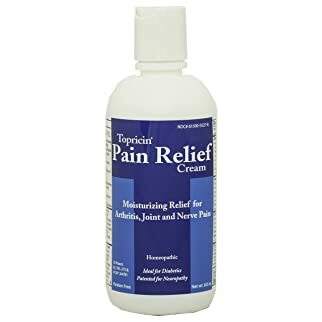 Topricin Topical Pain Relief Cream is a product of Topricin – the manufacturer with 22 years of experience in the medical industry. The cream is moisturizing, non-irritating, odorless and greaseless. It supports the human body in the natural process of healing the cells that are causing pain. Safe, effective and gentle: it can apply on children, the elderly, pregnant women, and diabetics. One drawback of this cream is that there is no clinical study backed it with what the ad ways. Topricin Topical Pain Relief Cream contains Echinacea. In general, it is a good ingredient that stimulates the immune system. But for Lupus patient, Echinacea is something they have to stay away from. So, for Lupus patient, this pain relief cream is not for you. Real Time Pain Relief Pain Cream is a product of Real Time. It has been around in the market since 1998 with its proprietary herbal blend. 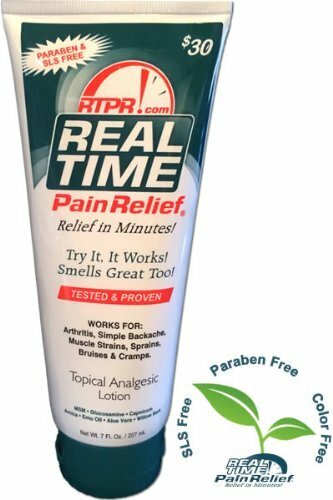 Real Time Pain Relief Pain Cream is a harmful-free, GMOs free, and paraben free product, following FDA requirements. Do not apply Real Time Pain Relief Pain Cream on wounds or damaged skin. It will worsen the situation. The product is a little bit on the expensive side but for its reputation, it is worth that. Penetrex Cream from the manufacturer Penetrex with its breakthrough and advanced formula can relieve different types of pain. The list of Penetrex effects includes: Arthritis, back pain, carpal tunnel syndrome, tennis elbow, golfer’s elbow, tendonitis, bursitis, sciatica, neck pain, shoulder pain, hip pain, shin splints, neuropathy, fibromyalgia, plantar fasciitis, heel pain, chronic pain, etc. Immediate and lasting relief for a large number of pain all over the body like: Arthritis, back pain, carpal tunnel syndrome, tennis elbow, golfer’s elbow, tendonitis, bursitis, sciatica, neck pain, shoulder pain, hip pain, shin splints, neuropathy, fibromyalgia, plantar fasciitis, heel pain, chronic pain, etc. Apply cream over entire area of discomfort 3-4 times per day for the first 7 – 10 days. Penetrex cream is a product that many people have tested the product and are satisfied with it. You can find thousands of reviews for this one in Facebook. However, always decide for yourself. Sombra Warm Therapy Natural Pain Relieving Gel is one of the leading topical analgesics in the market. The warm therapy helps with chronic conditions and basic aches and pains. The gel is more like a lotion which is suitable for message therapy and more quickly to absorb. The only drawback of Sombra Warm Therapy Natural Pain Relieving Gel is some skin irritations that some people with sensitive skin report. 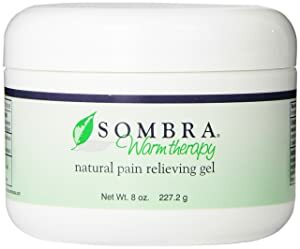 Being one of the cheapest products in the list, what Sombra Warm Therapy Natural Pain Relieving Gel offers are worth the price. You+Relief Anti Inflammatory Pain Relief Cream is one of the world most natural pain relief cream. 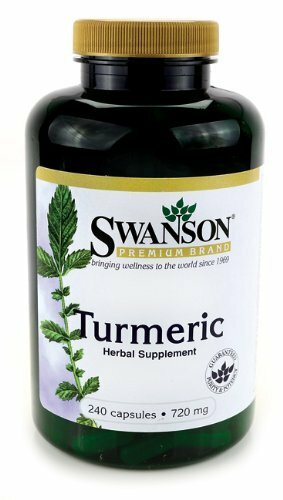 With 30 ingredients, it can help you with minor aches and pains of the muscles and joints associated with simple, backache, arthritis, strains, bruises and sprains. All the ingredients come from the nature which make You+Relief Anti Inflammatory Pain Relief Cream a safe product to use. It is a GMO, parabens free family. The gel penetrates deep to boost circulation, enhance nerve function, and accelerate the recovery and healing product. People with arthritis, fibromyalgia, carpal tunnel, sports injuries, sore muscles, chronic neck, back, hip and shoulder pain can find a solution with this pain relief gel. You+Relief Anti Inflammatory Pain Relief Cream level of menthol is really low. That why the gel is not overwhelmed with the smell menthol. Instead, it has a slight scent that does not stay long. The gel is also greaseless, which leaves a great feeling on the skin. The major drawbacks to You+Relief Anti Inflammatory Pain Relief Cream is its price. $27.54 for 3.4 oz. is an expensive price. But considering the ingredients, pain relief effects, and its skin-friendly formula, the price is reasonable. Children under two years of age: consult a physician. 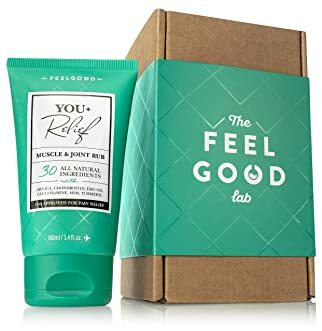 If you are looking for a natural product that is comfortable to apply on your skin, You+Relief Anti Inflammatory Pain Relief Cream is a good choice. However, for people who run low on budget, there are other suitable choices above in this article. To help you easier to choose the most suitable best pain relief cream and best pain relief gel, we have made a simple comparison table. You can see the key ingredients, usage, weight, and price of the topical pain reliever. 2.Amish Origins Deep Penetrating Pain Relief Cream (Greaseless) Menthol 8% arthritis, sore muscles and joints, cuts, abrasions, bruises, cough due to colds, head colds, throat congestion, sinus problems 3.5 oz. 3. 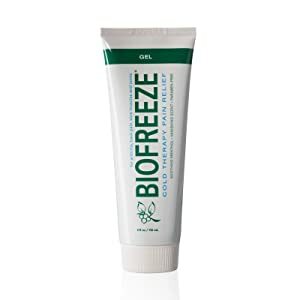 Biofreeze Pain Reliever Gel Menthol 4% arthritis, muscle pain, joint pain, back pain 4 oz. 7. Penetrex Cream Arnica Arthritis, back pain, carpal tunnel syndrome, tennis elbow, golfer’s elbow, tendonitis, bursitis, sciatica, neck pain, shoulder pain, hip pain, shin splints, neuropathy, fibromyalgia, plantar fasciitis, heel pain, chronic pain 4 oz. Do not let pain stop you from enjoying your life. Every day is supposed to be a good day, not a day of suffering. You can choose one pain relieving cream or gel from our list of the best pain relief cream reviews or pick on for yourself. Before saying good bye, we have some more notice for you on pain and pain relief cream. We hope this articles have been useful for you. What you eat also decide your life quality. If you eat more unhealthy food, you will notice negative changes in your body. On the other hand, healthy food aids the pain fight quite well. High energy food provides you more energy every day for work, life or exercise. One common reason for pain is leaving overheavy stuff. It creates the pressure on the body that causes back pain, tiring arms, etc. If this situation happens in a long time, the damage can be irreversible. It may turn into a life time pain that you have to suffer for your life. It is important you choose YOUR pain relief cream. Which one is the most suitable to your condition? Which one have the therapy method I like? Do I have enough money to buy it? Ask yourself all the questions before deciding. Consult your doctor before you use any pain relief cream or gel. It is even get more necessary to people taking any prescription medication. Though pain relief cream does not have so many side effects but it should still be taken with caution. When you want to use it on children, check with a physician to see if it if ok to apply the substance on a kid body. Do not overuse pain relief cream. There are always consequences to the skin under the case of overuse. It can be irritated skin, itching, dry skin or sticky skin, etc. These are the very minor reactions but more serious may come later. Just follow the instructions to get the most of the best pain relief cream and gel you choose. Read more: Outback Pain Relief Reviews – Only 3 minutes to disaapear the pains!